“I contracted Ebola because of love; I was caring for my mother and father who have now died of the disease”. Fatmata Kamara, 30, wept uncontrollably as she recounted her traumatic ordeal. Fatmata was giving the vote of thanks at an official ceremony for the discharge of 46 patients from the 120 beds Hastings Ebola Treatment Center. The Hastings Center is the only such facility manned entirely by Sierra Leonean health care professionals. The coordinator of the Center – Dr. Santigie Sesay, told me that since it was opened on September 19, 2014, they have admitted a total of 175 patients. “To take care of these patients, we have 9 medical doctors, 7 from the Ministry of Health and Sanitation and 2 from the Military Hospital. In addition to these, there are 104 nurses and 80 support staff”, Dr. Sesay said. More young Sierra Leonean health professionals are volunteering to save the lives of their people, but Fatmata might not be so lucky. She was a nursing student before she contracted the disease. Now she is not sure whether she would be able to complete her program and join her compatriots in national service. “My parents were responsible for my schooling, but currently I do not know what to do; who will support me to complete my studies”, she cried out. Fatmata’s story was pathetic. But it was the story of Aminata Bangura – only 5 years old, that sent a shiver through my spine. She also lost both her parents at her very tender age. Today, Aminata is going back to an empty home, without her biological mother and father, not sure whether her extended family members would ever be kind to her like her real parents; whether her playmates will ever play with her again; and whether she would ever have a chance to go to school again. Tired and uncertain about her future, the somber looking Aminata relapsed unto the chair and dozed off as the ceremony progressed. 17 of the 46 survivors discharged are under 18 years old. All of them are uncertain about how they will be received in their communities. Stigmatization has been a big problem in the Ebola fight. Health workers have been thrown out of rented houses, survivors ostracized in their communities – driving suspected cases underground. Now some families hide their loved ones, instead of reporting to health facilities. Others prefer moving to other places to die, spreading the disease further. But according to Fatmata, there was no need for such fear. “Do not hide your loved ones and do not treat them at home, even if they are your mother or father, otherwise, the virus may wipe out your family. Bring them to the hospital earlier and they would stand a high chance of survival, just like us,” she said. 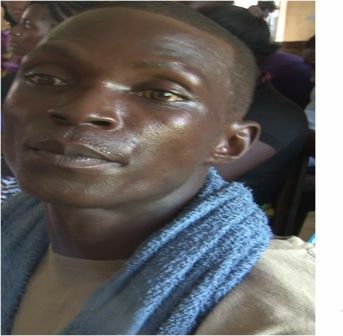 Alusine, 32, a painter from Makeni, Northern Sierra Leone explained that after his father and mother –in-laws died of the virus, his wife, who was initially caring for her parents, also became infected and died, leaving behind two young daughters. Therefore, no sooner he started experiencing diarrhea and vomiting, Alusine knew that his life was in danger. “I immediately ran to the hospital and reported myself and today, here I am, a survivor”, he stated. Alusine’s worry now is how to raise those two girls. The Minister of Health and Sanitation, Dr. Abubakr Fofanah, an expert in infectious diseases and control, explained that the case fatality at the Hastings Treatment Center was less than 28 percent. He said a good number of the patients were recovering and stable. Dr. Fofanah then appealed to the general public to accept the survivors, emphasizing that they were now very well and could no longer infect anyone. Dramatically, and to drive home his message of acceptance, Dr. Fofanah shook hands with one of the survivors and hugged one of the children onto his shoulders. “Several tests were done before they were confirmed to be free of the virus”, he went on. The Health Minister asserted that, in fact, these survivors were even safer from Ebola than the rest of the members of public, because they were now immune from the virus. Sierra Leone’s health workers are not the only professionals taking this Ebola fight head on. An impressive mix of lawyers, doctors, accountants, economists and communications specialists, calling themselves the “Young Professionals”, have also jumped into the fray with both legs. At Hastings, they provided hope to the despairing survivors. “We would support the orphans, and help those who want to go back to school to do so, said the group’s chair, Kabba Koroma (Esq). Mr. Koroma went on to say that this was a fight for every Sierra Leonean, irrespective of political persuasion, ethnicity or region. The “Young Professionals” presented a bag of assorted food stuff and toiletries, sanitary pads and condoms to survivors. The group plans to make similar donations to other sets of survivors due to be discharged next week from the Hastings and Port Loko treatment centers. Another doctor, Rene Vandi, probably in her mid-twenties, beaming with satisfaction said; “In the end, it was worth the wait seeing all those survivors being so appreciative of our little support”. Rene told me she had been up since 6am that day, after spending long hours the previous night sorting out and packing up the items. I met Rene at the gates of the Hastings Treatment Center at about 7:45 am, on the day of the event. She was one of the first people to arrive in anticipation that the event would start at 8:30. It didn’t start until a little over 12pm. Addressing the gathering, President Koroma said proudly that, this success story of Sierra Leoneans helping their compatriots has shown what coordination and dedication to service can do. The President further stated that the international partners would come and help, but the government and the people of Sierra Leone must also take ownership of this fight to save their people. “The Ebola virus outbreak has almost grounded our economy and we need to defeat this outbreak very soon,” said President Koroma. Even though he acknowledged the support from the international community, he still appealed for more assistance to stem this scourge. He added that the country needed more treatment centers – up to 1000 beds, now and not later. Ebola was first officially reported on 25th May 2014 in remote parts of Kailahun District, Eastern Sierra Leone in a chiefdom called Kissi Teng. By July, in just two months, the virus had spread virtually to every district, but one. As of the October 6, 2014, Ebola Situation Report from the Ministry of Health and Sanitation, the virus has claimed the lives of 699 Sierra Leoneans, and infected 2,464. 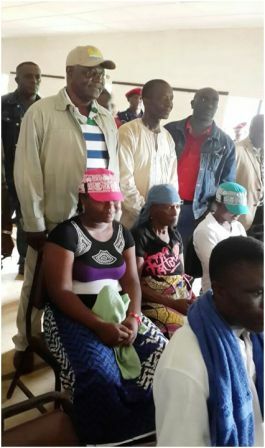 Over 40 of these were health workers, four of whom were senior medical doctors and we are still counting. As I write this article, news came in that one ambulance driver and a volunteer nurse attached to the Ebola holding center at the government hospital in Pujehun, in Southern province, have been confirmed Ebola positive. Both of them were being transferred to the Ebola treatment center in Kailahun, when on their way, unfortunately, the volunteer nurse (male) passed away. From the Northern town of Makeni, another nurse, Emma, 24, was among the survivors discharged at the Hastings Treatment Center but, being pregnant she was still worried about her baby. Emma contracted the disease in the line of service just as Mohamed from Waterloo, in the Western Area – who was still undergoing treatment at the Hastings facility. Mohamed’s wife, Zainab, a volunteer primary school teacher, is also pregnant. And although she is free from the virus, you can tell she was already experiencing economic difficulty; she looked malnourished and hungry. “Times are hard” she told me, “when my husband was well he was doing his best to provide for me”. My attention was drawn to Zainab by two nurses working at the treatment center. She had come to deliver some clothes for her husband and was already leaving when the two nurses came running after her. They were going to give her some money because her husband, (Mohamed) had told them his wife did not have money (less than half a dollar) to pay her way back home to Waterloo, some 7 kilometers away. This outbreak is not only killing people, it’s inflicting untold hardship on a population that is already poverty- stricken, and it is not showing any signs of a let up. The World Health Organization said the epidemic was spreading exponentially and Doctors without Borders say the number of new infections is doubling every two weeks. However and in spite of these particularly grim statistics and forecasts, Many Sierra Leonean health care givers have not abdicated; in fact, they have remained true to their Hippocratic Oath and committed to save their compatriots from the deadly clutches of this unprecedented epidemic. Other citizens, from all walks -of -life have also rallied round the national course. It is this sense of patriotism that was the reason for the apparent euphoria in the midst of distress. It provided a sense of nationhood, for a country besieged by an unseen enemy. It provides hope for innocent children like Aminata, who have been orphaned by this unforgiving disease.